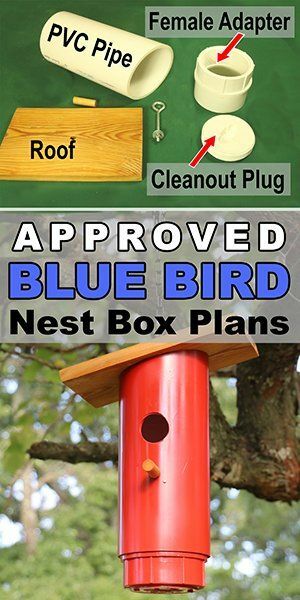 Below are free diy PVC blue bird nest box plans that can be used to attract bluebirds, swallows, chickadees, nuthatches, warblers, woodpeckers, wrens, and other birds to your backyard or garden. 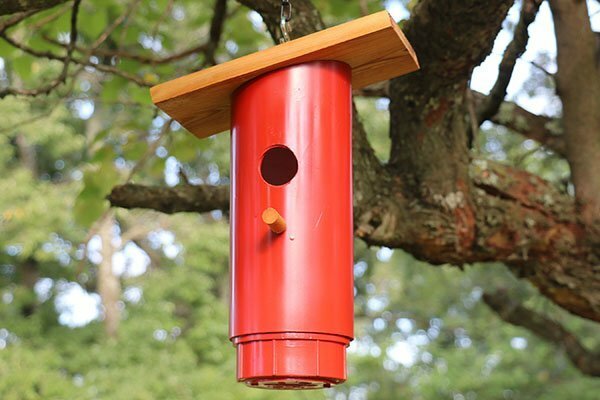 This birdhouse (nest box) is made using a piece of wood and PVC pipe. 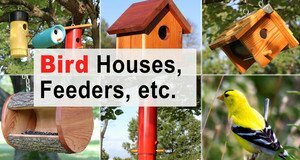 See more bird houses and bird feeders. Eye bolt: 1/4″ (0.6cm) diameter, approximately 4″ (10cm) in length. OPTIONAL: A PVC Snap-in Drain can be used to help hold the roof in place. DIY Video Tutorial – PVC Blue Bird Nest Box. 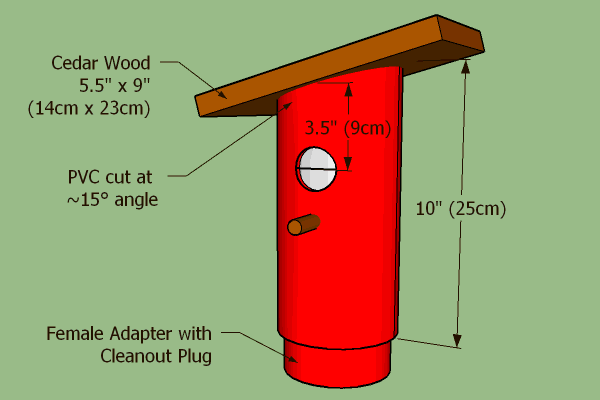 For an instructional video tutorial on building this PVC bird box see around 6:00 minutes into the following video. 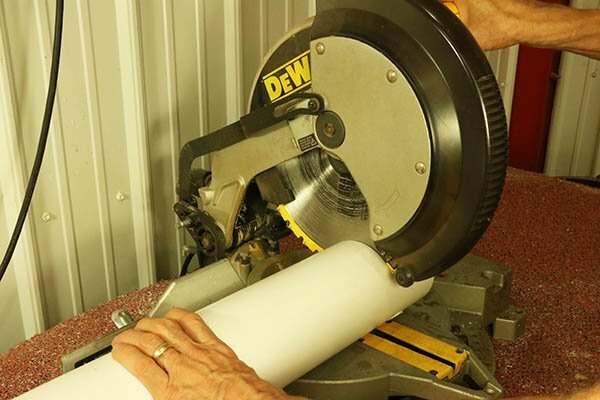 Cut one end of the PVC pipe at approximately 15 degrees. Then make a second (perpendicular) cut creating a PVC pipe 10″ in length as shown below. 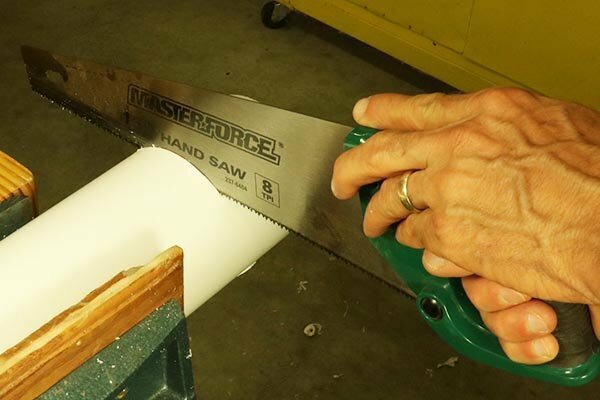 PVC pipe can easily be cut with either a hand saw or a miter saw. Step 2. Drill entrance hole and hole for bird perch. Drill the bird entrance hole using a forsnter drill bit. 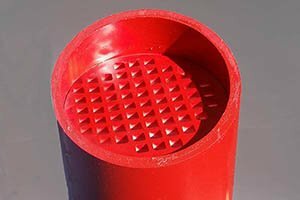 A 1.5″ (3.8cm) diameter entrance hole is the optimum size for bluebirds and tree swallows. However, chickadees, nuthatches, warblers, woodpeckers, and wrens will also gladly make this their home. See Bird House Hole Size if you want to attract a specific bird. Optionally, drill a 0.25″ (0.6cm) inch hole for the bird perch. Step 3: Glue PVC Female Adapter to bottom of Bird Box. Use PVC cement (e.g., Gorilla, Oatey, Weld-On) to bond the female adapter to the bottom of the bird box. Keep in mind, this glue dries really quickly! Once the two pieces have been fitted together, you have just a few seconds to position the pipe. While mentally hard to do, drill a couple holes in the new cleanout plug to allow for drainage. Step 4: Fasten Wooden Roof to Top of Bird Box. There are numerous ways to fasten the roof. These include wire, angle brackets, j-bolts, etc. 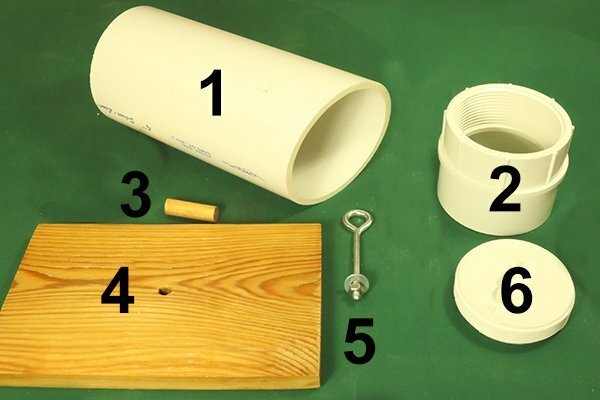 Personally, I like to use a PVC Snap-in Drain (located inside the bird box) along with an eye bolt to fasten the roof. Together, this approach results in a very clean design – with no exposed fasteners on the sides. You will find the eye bolt servers two purposes. First, it holds the roof securely in place. Secondly, it provides a loop to firmly secure a chain, cable, or rope for mounting the birdhouse. 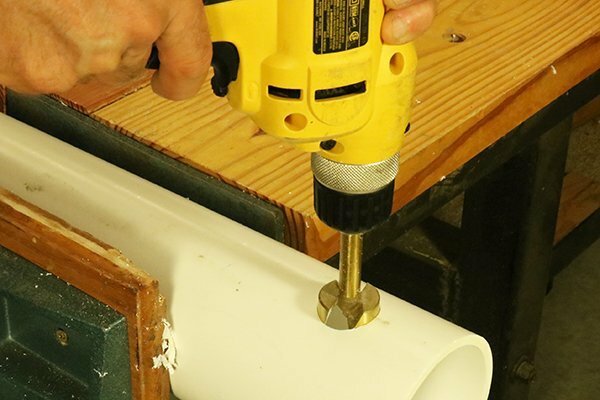 To use a Snap-in Drain (one piece all plastic), you will first need to remove the lip (rim) so the entire drain can be position inside the PVC pipe. An angle grinder with either a metal or wood attachment will quickly remove this lip. Once this lip has been removed, glue (join) the snap-in drain to the top of the birdhouse using PVC Cement. Make sure the Snap-In drain is completely below the slope of the PVC pipe. See the images below and video above for more instructions and directions. Finally, insert the eye bolt through the wooden roof and through one of the holes in the Snap-in Drain. For the safety of the birds, you might need to cut the eye bolt so it does not extend into the bird box. Step 5: Optionally add Bird Perch. 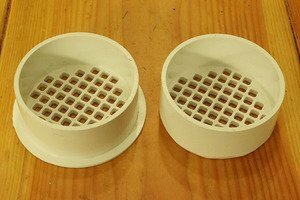 To create the bird perch, I drill a hole in the PVC pipe and insert a 1/4″ (0.6cm) bolt. I then take a short piece of 1/2″ (1.3cm) wooden dowel and drill a 1/4″ (0.6cm) hole part way through the dowel. Next, I glue the dowel onto the bolt using Gorilla Glue. Step 6: Optionally paint PVC pipe and apply finish to wood. If the birdbox will be mounted in the sun, you might want to leave the PVC pipe unpainted or pick a color that will reflect sunlight. However, keep in mind birds are quite happy to nest in painted bird boxes (pink, yellow, blue, etc.) Try not to paint the inside of the box or around the entrance hole as birds may peck at it and eat chips of paint. Note: You should always try to position bird houses in a shady area if possible. To help accentuate the grain in the wood, and to help make the wood more resistant to damage, you might want to consider applying a food-safe oil to the wooden roof.